LACQUER MANUFACTURE PROCESS IN VIET NAM. Step 1 (2-7 days): Framework, being used of nature and synthetic material as bamboo, wood, ply-wood, pressed paper, composite, pottery, vv [P1, P2]. Buoc 1 (tu 2 den 7 ngay): Moc , su dung cac loai nguyen lieu tu nhien va nhan tao nhu tre, go, go dan, giay ep, composit, gom.v.v.. de tao dang san pham._ A1, A2. Step 2 (2 days): Make dry and treating as closely connect, protect. And then using coarse-cloth and nature paint to cover product. That make product be strongly, do not curled up [P3]. Buoc 2 (2 ngay): Phoi kho va su ly tho nhu gan, ba, ghep sau do su dung vai va son de bo san pham tao do ben vat lieu va chong co ngot. _ A3. Step 3 (2 days): Cover product by paint with talcum or soil material (like glue ), make dry, water grind and make smooth [P4, P5, P6]. Buoc 3 (2 ngay): Bo lot nuoc vai ba nuoc son tron dat nhu keo), phoi kho va mai lay do phang _ A4, A5, A6. Step 4 (2 days): Two-time cover (make decrepit) by paint and talcum or soil mixed. The first time thick- make and water grind, then make dry, we have got thick face [P7}. The second time thick make and water-grind, make dry. That make flat of face-product [P8, P9, P10]. Buoc 4 (2 ngay ) : Hom 2 lan ( ba son tron voi dat hoac bot da ). Lan 1 ba day va khong mai de lay do day_ phoi kho_ A7. Lan 2 ba lay do day, phoi kho roi mai lay do phang. _A8,A9,A10. Step 5 (1 day): One time cover product by watery-paint, make dry and then fill up fault holes, get flat. Make dry and flat water-grind [P 11, P 12]. Buoc 5 (1 ngay): Lot, dau son loang roi quet mot nuoc long, phoi kho roi ket ( ba lap cho loi lom ) lay do phang , phoi kho roi mai phang. A11, A12. Step 6 (1 day): The first thick-paint covered, make dry, flat water-grind, one more time fill up fault holes by paint and then make flat water-grind [P13]. Buoc 6 (1 ngay): Thi nuoc 1 (quet mot nuoc son day), phoi kho_mai phang_ phoi kho_ ket nhat ( ba lap cho sot )_ mai. _ A13. Step 7 (1day):The second thick-paint covered, make dry, make flat water-grind. Finish this step we have half-products, it is called VOC [P14]. Buoc 7 (1 ngay): Thi nuoc 2 (quet mot nuoc son day) _ phoi kho _ mai phang, nhan _ ra ban thanh pham dang tho goi la voc. _ A14. Step 8 (5 days): Silver-sticking, cover one time of watery-paint as glue, that caused for silver-paper sticking in necessary area (on face or back-side)[P15 to P21]. Buoc 8 (5 ngay): Dan bac la. Dap mot nuoc son mong lay do dinh roi dan phu mot lop bac giay ( bac qui ) vao nhung phan can thiet. Phoi kho. A15-A21. Step 9 (1.5 days): Silver washing and make first time color-paint, make dry, water grind, make dry and then make design on product as chicken, longevity, 3 writing...[P22 to P 25]. Buoc 9 (1.5 ngay): Mai rua bac _ toat son mau nuoc 1_ phoi kho _ mai. _ve, in. A22-A25. Step 10 (1.5 days): Make second time color paint, make dry, water-grind [P 26 to P 28]. 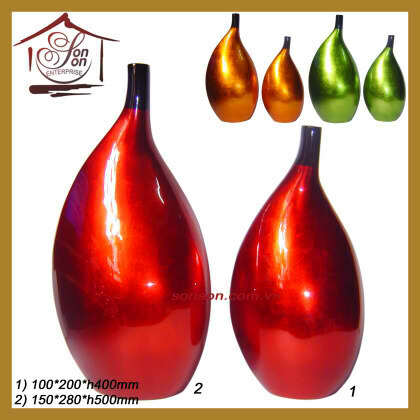 We have to make the thirst time or more color-paint layer for products except gold and silver color product. Buoc 10 (1.5 ngay): Toat son mau nuoc 2 _ phoi kho _ mai rua. _ A26-A28. Toat son mau nuoc 3 cho cac san pham khac ngoai mau vang & bac, phoi kho _ mai. Step 11 (2 days): Make one time of black-paint at the backside of product, make dry, flat water grind then make dry [P29]. Buoc 11 (02 ngay): Quang ( quet ) mot nuoc son den dang sau hau san pham_ phoi kho _ mai nhan. _ A29. Step 12 (1day): Polishing product by one kind of starch and substance used for polishing on both side of product. Finish process [P30]. Buoc 12 (1 ngay): Danh bong san pham. Su dung mot loai bot min va si danh bong de danh bong ca hai mat san pham (hoan thanh). _ A30. Note: Period of the above process and quality of lacquer product do depend on weather. It is right for good weather, not to much raining or so much hot. Ghi chu: Thoi gian cua qui trinh tren la khoang thoi gian trung binh, thoi tiet thuan loi. Neu mua nhieu, troi am nom thi thoi gian can nhieu hon du tinh. Hoan Kiem District, Hanoi, Vietnam.